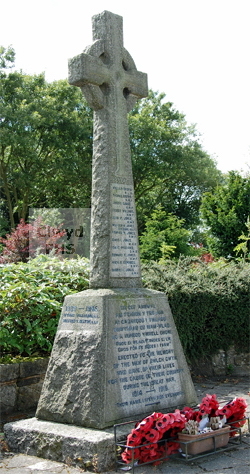 The Bwlchgwyn War Memorial commemorates those from the area who were killed in World War I and World War II. It takes the form of a standing stone Celtic Cross with the names engraved on the plinth. The village of Bwlchgwyn lies on the edge of the moors in the county borough of Wrexham. It forms part of the community of Brymbo. Until 1974 the area was part of the historic county of Denbighshire and, between 1974 and 1996, part of the county of Clwyd. 10004 1st Bn. Royal Welsh Fusiliers 23 Aug 1915 27 Born in Dublin, Ireland. Son of Mrs McGeever (formerly Brown) of 1, Brymbo Road, Bwlchgwyn, & the late William Brown. Brother of William Brown (below). Le Touret Memorial. 7132 1st Bn. King's (Liverpool Regiment) 10 Mar 1915 32 Born in Dublin, Ireland. Son of Mrs McGeever (formerly Brown) of 1, Brymbo Road, Bwlchgwyn, & the late William Brown. Brother of Thomas Brown (above). Le Touret Memorial, France. 15879 9th Bn. Royal Welsh Fusiliers 25 Sep 1915 Born in Llanfairpwllgwyn, Anglesey. Lived in Bwlchgwyn. Loos Memorial, France. 87005 16th Bn. Royal Welsh Fusiliers 8 Oct 1918 23 Son of William & Mary Jane Edwards, of 'Holly House', Glascoed Road, Bwlchgwyn. Bois-Des-Angles British Cemetery, Crevecoeur-sur-l'Escaut, France. 17068 2nd Bn. Royal Welsh Fusiliers 24 Sep 1917 21 Son of Elias & Martha James, of Nant Ganol, Ffrith, Wrexham. Also named on the Llanfynydd War Memorial. Tyne Cot Memorial, Ieper, West-Vlaanderen, Belgium. 3576 89th Coy. Machine Gun Corps (Infantry) formerly 20613 Royal Lancs Regt. 7 Jul 1917 28 Son of David & Sarah Jones, 15, Brymbo Road, Bwlchgwyn. Lived at Tyldesley, Lancashire, England. Belgian Battery Corner Cemetery, West-Vlaanderen, Belgium. 29384 19th Bn. Royal Welsh Fusiliers 6 May 1917 23 Born Treuddyn. Son of Robert Owen & Edith A Jones, 21, Brymbo Road, Bwlchgwyn. Fins New British Cemetery, Sorel-Le-Grand. 32556 1st Bn. Royal Welsh Fusiliers 2 Mar 1917 28 Son of Price and Mary Jones of 5, Wesley Rd., Bwlchgwyn, Wrexham. Varennes Military Cemetery, Somme, France. 200550 16th Bn. Royal Welsh Fusiliers 13 Nov 1918 22 Son of Edward & Sarah Ann Jones, of Bwlchgwyn. Etaples Military Cemetery, France. 49766 1st Bn. Cheshire Regiment 13 Apr 1917 21 Son of William and Sarah Ann Jones, Carreg Llydan, Cymmau, Wrexham. Givenchy-en-Gohelle Canadian Cemetery, Souchez, Pas de Calais, France. 201150 1st/4th Bn. Royal Welsh Fusiliers 6 Apr 1918 31 Son of Peter & Margaret Ann Williams of Waen Farm, Bwlchgwyn. Martinsart British Cemetery, France. 21032 10th Bn. South Wales Borderers 1 Aug 1917 34 Son of Isaac & Sarah Williams of 4, Nant Road, Bwlchgwyn; husband of Annie Williams, 15, Pioneer Terrace, Cwmfelinfach, Ynysddu, Monmouthshire. Menin Gate Memorial, Ieper, West-Vlaanderen, Belgium. 1058416 61 Sqdn. Royal Air Force Volunteer Reserve 10 Sep 1942 21 Son of Mr & Mrs William Belton of 8, Wesley Road, Bwlchgwyn. Also named on the Wrexham War Memorial. Reichswald Forest War Cemetery, Germany.